Love does win. But I see a lot more questions than answers about what that means, what love looks like, and what loses when it wins. Most days I don’t have answers to most of the questions. But there are five days a year that I can tell you exactly what love looks like. And exactly how it wins. It’s probably fair to say that the week I spend each year as a part of Royal Family Kids Camp is my favorite-worst-week of the year. You guys, it’s exhausting. And my body reminds me of that with each moment I awake in a camp-bunk-bed (notice I said moment, not morning, because someone did not exactly sleep soundly). It’s hot and dusty and endless hours without quiet. Oh and there’s that pesky little thing of confronting child abuse. I will tell you, there is nothing fiercer in this life than looking into the eyes of a ten year old who has been intentionally abandoned by his mother, or a six year old who awakes each night to the terror of her mother’s recent death, or the stiff upper lip of an eight year old who has learned how to live on defense as it seems the whole world plays against him. But I will also tell you that there is nothing more enchanting than seeing those eyes start to believe they are treasured, and those dreams beginning to feel safe, and faith that someone out there actually has your back. It’s only five days. But it’s five days of knowing exactly what love looks like. Love looks like … Preparation. Anticipation. A hundred+ volunteers gather a day before a single camper sets foot on camp. To prepare. To anticipate. To color. To decorate. To set the stage. One of my absolute favorite moments of all is when the counselors and staff gather on the lawns just as the camper buses are about to arrive. 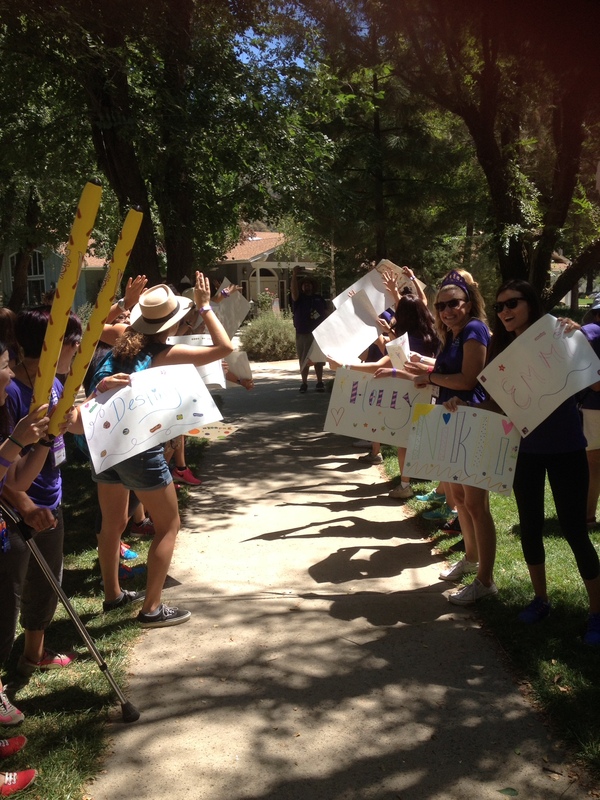 Signs with each campers’ name are held close in the hands of their counselor. The cheers and the hollers that go out as the bus rounds the corner chokes me up big time. Every. Time. Because love prepares. Love anticipates. Love is so dang excited to meet you. And so it is with Jesus. He who prepares a place for us (1 John 14:3), who prepares a table before me in th e presence of my enemies (Ps. 23:5). This year, I got to help set up the tea party table. Anything whimsical will do. Throughout the week, I know that each camper will don a silly dress-up costume and talk with a British accent, and we will say “when in doubt, pinkies out” more times than I can count. Their enemies – both the ones inside and the ones that are waiting for them at “home” – don’t go away. But still I set the table. And I see my God in this. Preparing tables for me in the midst of my enemies. And moreso, preparing a Kingdom. One that “no eye has seen, nor ear heard, nor the heart of man imagined, what God has prepared for those who love Him” (1 Cor. 2:9). Love looks like … Anger. Wrath. Surprised? Me too. See, I’ve read “the love passage”. I know that it’s patient and kind and long-suffering. But it’s also angry. Not forever (Jeremiah 3:12), but I gotta say that I kind of like a love that can get angry. Some people express their anger towards inanimate objects. I may or may not have uttered words of scorn and hatred towards my computer, slow internet connections, bad phone reception, and general technology this week, only to realize that really I wasn’t angry about any of those things, but about the unbelievably helpless feeling one has when an eight-year-old wears a diaper to bed. Love gets angry. Thank God. Literally. Because you know what, I like a God who says his wrath is poured out against all ungodliness and unrighteousness of men. I know there are a lot of debates about what’s ungodly and unrighteous. But those debates expire in the face of child abuse. I’m also grateful that wrath isn’t our destiny. Two years ago, I spent months and months wrapped up in anger. Deep, intense, bitter anger. Coming from deep, intense hurt. I was confused, fearful, and felt tossed away and discarded from a place that had felt safe. You guessed it: from a Church. You guys, I’ve never known such disorienting anger before. Months later, I stepped foot back in that same Church. I would have said my anger had dissipated. A little, at least. The minute I crossed the threshold, I knew it hadn’t. And all I wanted was to be right about it. To be allowed to be angry. To hold my arms tight across my chest and say “nuh-uh, we aren’t going to be friends.” And I really didn’t want to hear one more Christian-ese-quote about getting better instead of bitter. See, I expected God to say what I had heard a lot of Christians say. He didn’t. Instead, He said, “Me too. I’m angry too.” He says that, you know, when one of His kids has been hurt. He gets real mad. But then a Pastor took the stage and started talking about the Cross. How the wrath of God, while right, while righteous (yesssss, I’m listening … I know all about righteous wrath), was collected and poured out at the Cross. And you know, I feel real good about that when I’m shielded by that Cross as anger or frustration is cast at me. But when I’m doing the hurling, when the insults are on the tip of my tongue and the rotten fruit is in my grasp, it’s real hard to think of Christ’s cross shielding them. Feeling that anger, giving space to all the feels, even the uncomfortable ones, is a big part of understanding God’s heart. Towards us, for us, and with us. A God who is fierce enough to get angry. But also gracious enough to collect all of the world’s wrath and let it break HIM instead of us. Love looks like … Celebration. One time we got a puppy. You can read more about that here. She’s taught me a lot about celebrating. Because, see, when you spend thousands of dollars on a dog’s knee surgery, and then months recovering not only from the surgery itself but also being “that girl” who sacrificed her credit card at the vet’s altar, when you’ve sat in the vet’s office judging all those that came in wearing matching scarves with their cat (not a joke) and carrying dogs on purple pillows (also not a joke) only to realize that the only thing separating you from them is one degree of crazy … well, when that becomes part of your story, so does celebration. Because dang it, every time this pup runs after a ball or chases me down the beach, I celebrate. I celebrate the heck out of every step she takes. I know how much they cost. So at camp, there’s this thing we call “The Variety Show”. Think talent show, but intentionally substitute the word ‘variety’. Don’t get me wrong, there’s some real talent too, but mostly variety. Any camper can get up on stage and do any act they want. Tell a joke. Sing a song. Build a human-pyramid. Every camper is encouraged to participate. None is required to. Our job is simple. To celebrate. And I’m talking scream-like-a-banchee-whoop-and-holler when someone hits the last note of their song no matter how off key it was. And we mean it. Because it’s not about the act. It’s about the actor. It’s about saying “You, YES YOU, are worth jumping up and down like a crazy person for.” If you’ve ever heard the song ‘Undignified’, you may have, like me, thought it rather ironic that most churches sing it in a very dignified manner, carefully enunciating each syllable of “I will be-come ev-en more un-dig-ni-fied than this.” My God, I sure hope so. But at camp, we really do get undignified. Nothing makes your heart swell faster than watching grown men (most of whom wear business suits 51 weeks out of the year) get up and dance to the tunes of a ten-year-old “rock band.” Nothing. Because love celebrates. Love celebrates because love knows what it costs. Love celebrates because it’s not about the talent, but the variety. And Love looks like … more. There’s always more. I mean, really, I can’t tell you how much I love the people who spend five days each year of their own vacation time and their own money to come and give it away here. It’s not just family for the kids. These volunteers are also my family. I would fight for them. And I don’t even know most of their last names. Still, it’s just five days. And as much as I love what can be accomplished in that wee week, I leave every year with that tug that there’s more. And it looks so very different for everyone. I’ve shared before about the statistics that moved me out of my seat and broke my hard candy shell. Those still move me. I mean, really, I’d love to put this camp out of business. And really, that’s so very doable. Not easy, but doable. I think this generation could be the one to end the world’s orphan crisis. Or at least severely disarm it. The orphaned population is at the root of just about every social justice issue that haunts us. At camp we give out pins, little “badges” for the kids to collect as they do activities like ziplining, swimming, hiking, etc. Little mementos to say “yeah, you did that.” One of the pins is a ‘good deed pin’, a way for their selfless good deeds to be acknowledged and rewarded, everything from showing kindness to a younger camper to busing the table for one of the senior volunteers. It’s unscripted, and the good deeds abound. But this, this orphan care crisis is not about good deeds. It’s not about collecting badges and pins. For the Christian, it should forever and foremost be an outflow of God’s heartbeat, His DNA, because He describes Himself as an adoptive father. One who has cared for orphans. Us. You and me. God says He gives us the “spirit of adoption” so that we can call him Daddy. We are rescued in order to rescue. Anything else is just empty and dumb. And will last about as long as a good deed pin. And “rescue” takes all kinds of shape and form. There’s no automatic prescription and there are great minds and hearts around the world debating the best ways to help without hurting. So I don’t know what it looks like for each one of us. But I know that love looks like more. There’s more to give. And there’s oh so much more to receive. That looks like an amazing camp! I loved reading about your experience. I would like to volunteer for something like that, too — I’m going to search and see if there’s anything in my area. Yes it’s so wonderful! They have over 200 camps worldwide, so hopefully something near you!